It’s estimated that the cost of cyber crime damages will hit $6 trillion annually by 2021 according to Cybersecurity Ventures – which means businesses large and small stand to lose if they aren’t on the front foot and on guard. Cyber crime is constantly evolving and becoming more sophisticated. Even if you have the latest anti-virus software on every computer and have an excellent firewall in place, there are still threats lurking on the internet that could cause massive problems for your organization if your employees aren’t vigilant. And employees, unfortunately, are often the weakest link when it comes to cyber security. Training your employees to be on the lookout for various cyber security threats is one of the best things you can do to stop your company becoming part of the statistics. 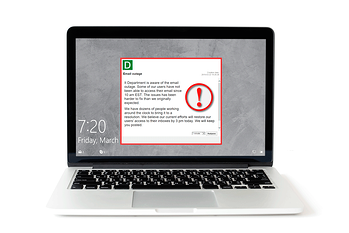 A great way to do this is via DeskAlerts where you can quickly send pop-up messages to your employees’ desktops warning them about various security issues as they arise, or as a general refresher to remind them of what they need to look out for. Hackers use a technique known as “typosquatting” to capture login details of unsuspecting victims. This works by creating a website with a URL very similar to a legitimate company’s website, hoping that when someone creates a typo when they put the address in the address bar they will happen upon the fake and enter their credentials into it. It’s a good idea for your employees to bookmark commonly used sites to avoid typosquatting incidents. Phishing emails are fake emails sent to look like they are from a legitimate organization. When the recipient clicks on the link, they are taken to a dummy site where they are usually asked to provide a username, password and other personal information. This data is then available to cybercriminals who can use it to access the legitimate site. Malware is malicious software that can infect your organization’s IT systems. It is usually spread by being sent as an email attachment or as a download from a site that looks reputable but isn’t. It can take different forms, not just as a virus, but also ransomware – where criminals ask for a ransom payment to be paid in order to restore your systems to normal. When employees leave your company – either because they resign or are terminated – they may take data with them or continue to access data because their credentials have not been revoked. If your company isn’t doing this, it is possible hundreds, if not thousands, of former employees could still have access to your systems. Keylogging software is installed on computers, often by a virus. The software captures and records a user’s keystrokes, which is then transmitted to cyber criminals. Any secure information including passwords, credit card details and other sensitive data could be compromised.